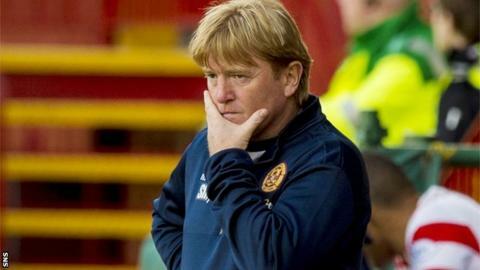 Motherwell manager Stuart McCall admitted his side were simply not good enough in the 4-0 drubbing by Hamilton. It was the Lanarkshire side's third consecutive loss on their own ground, conceding seven goals in the process. McCall made seven changes from the League Cup defeat on Wednesday night, when Hamilton won through on penalties. "We made the changes, but Accies looked the fresher side, they dominated in every area and were outstanding," the Fir Park boss said. Despite Hamilton's threat going forward, McCall was left bemoaning the way his side contributed to their own downfall. "We will never win games if we give away goals like the first two. It was really schoolboy errors," he added. "We had to have a go in the second half. We made changes at half-time and had four good chances at the start of the half. "We have to have a good look at ourselves, the players and myself." Louis Longridge won Hamilton a penalty following a challenge by Fraser Kerr and Mikael Antoine-Curier converted for Hamilton's third goal. And McCall said: "Although it didn't change things the penalty that kills us was outside the box. "But that just masks things."